Celebrity Cruises have announced that the Celebrity Summit will be 'Solsticized' during next January's drydock refit, following the success of the sister ship Celebrity Constellation's Solsticizing last year. By January 2012 the three popular Millennium class ships Celebrity Constellation, Celebrity Infinity and Celebrity Summit will be emulating the innovative accommodation and venues of the Solstice class ships, while retaining their renowned elegance. Celebrity’s President & CEO Dan Hanrahan said: "Based on the phenomenal response we’ve had from guests who have sailed on the ‘Solsticized’ Celebrity Constellation, we’re eager to introduce the same new features – ranging from the ‘Cellarmasters’ wine bar to our signature ‘icy’ Martini Bar to our cool Café al Bacio and Gelateria – and even more on Celebrity Summit... We recognize that consumers’ vacation time is precious, which inspires us to do everything we can to make their vacation with Celebrity Cruises something that is truly different and better than anything they’ve experienced before." One of Celebrity's most popular Solstice class signatures, the coveted AquaClass staterooms, will be among the new additons to the Celebrity Summit. The spa-inspired balcony cabins will again be paired with the exclusive Med-themed 'Blu' restaurant and are sure to be a hit. There are also plans to restyle the other staterooms onboard with new carpets, upholstery, bedding and flat-screen TVs, the public areas will also benefit from new carpeting and upholstery to give the ships the modern, classy, colour scheme and finish of the Solstice class ships. New venues onboard will include the popular fusion cuisine found in 'Qsine', the ice-topped Martini Bar, the Bistro on 5 creperie and the inviting Café al Bacio and Gelateria. Cellermasters Wine Bar, with it's innovative enomatic wine serving system will allow guest or select wines by the glass at a touch of a button. The trendy Celebrity iLounge, which when debuted on the Celebrity Eclipse became the first Authorized Apple Resellers at sea, where guests can participate in Celebrity's iLearn enrichment series. 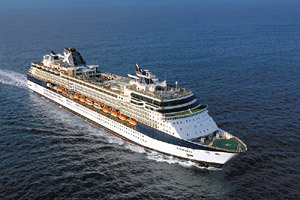 Celebrity Infinity will emerge from drydock in early December with Celebrity Summit following in January 2012. Both ships will enjoy these stunning upgrades and help keep Celebrity at the top of their game.